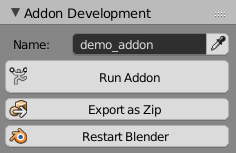 Code Autocomplete comes with several tools which simplify addon development inside of Blender a lot. Blender itself is not good for it, because it is hard to manage multiple files and to register everything correctly. 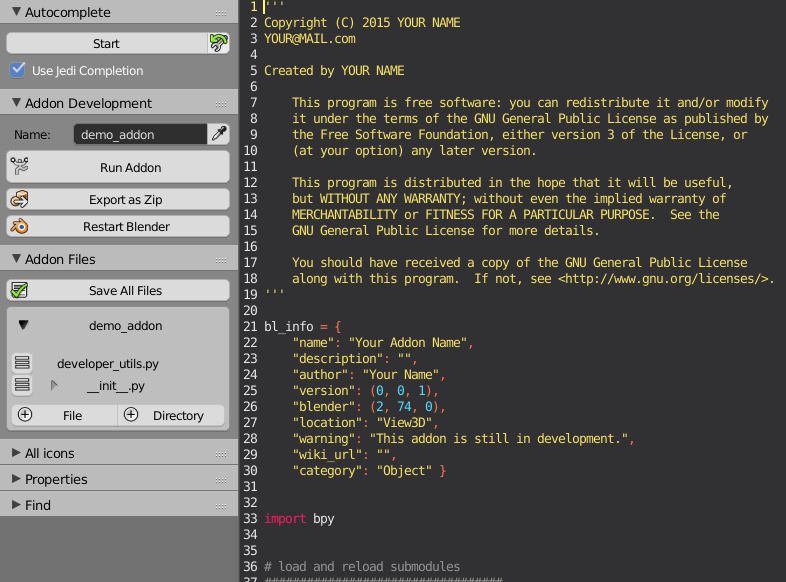 This addon tries to overcome these difficulties by providing templates and operators to quickly create, extend and export code. 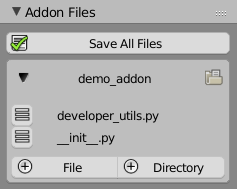 The Addon Development tools only work with addons which have their own folders (not single-file addons, these can be created without Code Autocomplete). Before you can start coding you have to choose which addon you want to work on. You can either work on an existing one or create a completely new one. To select one that already exist you can write its name in the corresponding field or click on the eyedropper next to it to get a list of all installed multi-file addons. To start a new addon you have to write the name it should have in the text box. Code Autocomplete will check automatically if the addon already exists and decides wether it should give you the options to create a new one or not. It will also not allow you to use addon names that may become problematic later. If you inserted a ‘incorrect’ addon name, a button to correct this name appears. Basically this operator replaces spaces with underscores and makes everything lower case (this is not the name the end user will see, and changing it later is easy). This template contains only the minimum code that is needed to have a valid addon. There is the bl_info property as well as the register and unregister functions. This (recommended) addon template contains the same as Basic, but beside that there is a license and code that simplifies loading the different files of your addon. The loading code is the same that imports other addons like Code Autocomplete itself, but also the Animation Nodes addon. As soon as you select a template the addon folder will be created. A new panel called Addon Files appears and the __init__.py file that is the heart of every addon is displayed in the text editor. This panel gives you access to all the files and directories in your addon. You can create, open, rename and delete files. For more file manipulations you should open the addon folder in your default file browser using the folder icon. The Save All Files operator looks which files you have currently opened and will save them. When you Run the addon this will happen as well. When you click onthe Run Addon button all files will be saved first. Then your addon will be unregistered (if it has been registered before), reloaded and registered again. You should not use the normal Run Script button at the bottom. From time to time it is useful to Restart Blender to have a clean working environment, so that you are not effected by earlier code executions. This operator currently only works on Windows. When your addon is in a state so that you want to share it, the Export as Zip operator becomes very handy. After clicking you have to choose an output location and name. Now you complete addon will be packed in to a zip file that others can install.